Custom Pre-Printed Barcode Labels - A Bar Code Business, Inc. Most Common Methods of Acquiring Printed Bar Code Labels. You can purchase hardware and software for printing bar code labels in-house, or you can purchase pre-printed bar code labels from companies that specialize in the production of bar codes. 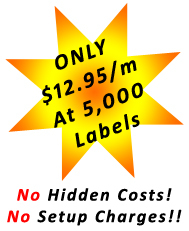 Pre-printed bar code label vendors can supply labels with a variety of information on a multitude of label stocks. Choosing to use pre-printed bar code labels eliminates the capitol investment needed for label printing equipment, the staff to run the equipment, and the management required to assure that quality labels are being printed. 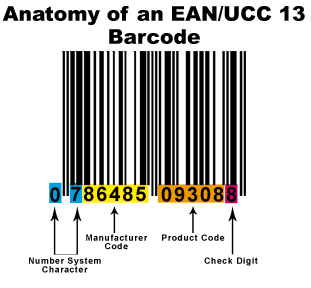 Many retail stores have implemented charge back policies for UPC & EAN retail bar codes that do not scan or scan incorrectly. Your pre-printed label vendor should have a level of expertise and verification equipment to ensure that the bar codes scan consistently and accurately. Should You Buy Pre-Printed Labels or Print Your Own Labels? If the information encoded in the bar code is fixed and only several hundred labels per day are needed, buying pre-printed bar code labels is more economical than printing them on-site. Likewise, if large quantities of bar code labels are required for a one-time project — capital asset inventory for example – pre-printed labels are more cost-effective. The choice of custom pre-printed labels over on-site/in-house printing becomes less clear-cut in applications falling between these two extremes. The central question in determining whether pre-printed labels will be more cost effective is; do you know the data you want to print in advance? In most bar code applications, the bar code symbol is like a license plate. It need only encode a unique serial number, either unique to the individual item or to the product line. The detailed information is then stored in a database under the unique serial number. In such an application, pre-printed bar code labels are a perfect fit. In some applications where the data changes from one label to the other, label vendors can print bar code labels from variable data supplied by the customer. 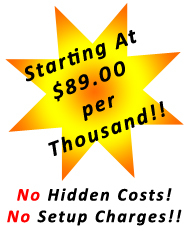 Why Choose A Bar Code Business, Inc.? A Bar Code Business, Inc. has been an industry leader and for more than 25 years we have been providing customers with custom pre-printed labels that not only meet the demand but most importantly the function for all types of applications. Our emphasis is on quality and service. Bar code verifiers are used in our printing department to ensure the codes scan consistently and accurately. This ensures that only the highest quality bar codes are produced and shipped to our customers. Our standard turn-around is only 1-2 business days after receipt of an order. Rush orders can be shipped if ordered and approved by 1:00 EST. What Are The Most Common Bar Code Label Stocks? Thermal Transfer Paper material is the most common and cost effective labeling for indoor applications. Retail barcodes UPC / EAN, inventory control, price marking, and work in process applications are just a few of the many popular paper label uses. Direct Thermal paper labels are the most common label for shipping applications. Polyester is a Thermal Transfer synthetic material specially designed to provide superior scratch and smear resistance than paper materials. Polyester labels are recommended for indoor/outdoor applications where durability and longevity are required such as Asset Identification Numbers, Printed Circuit Boards, Item Tracking, and many more. Choose 1 of 4 most popular sizes for retail UPC and EAN Codes. UPC bar codes were originally developed to automate the supermarket point-of-sale checkout process and keep better track of inventory and reorder points. 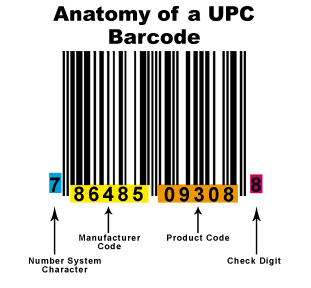 Most retailers require either the UPC-A or UCC-13 type bar code above. 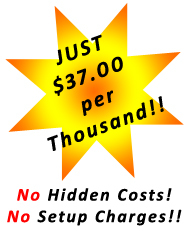 Above pricing is a per thousand label price for white Thermal Transfer paper material, printed in black. Label quantity of 2,500 can be divided between two different numbers, 5,000 labels can be divided between 5 different numbers at no additional charge. Labels are verified and guaranteed to scan! inventory control, various types of permits, etc. 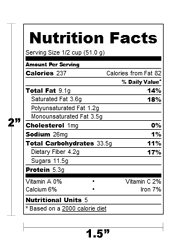 Food Labels serve two purposes – to entice and inform your customer. It’s important that your food labels are high quality in order to stand out on the shelves and appeal to your customer while listing all the information required to meet the local and federal government requirements. experienced sales department. We will be happy to assist you.